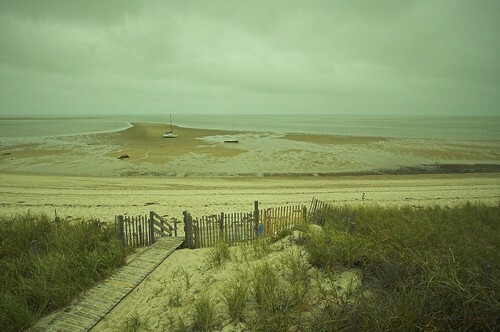 The beach along Brewster, Massachusetts, in the crook of Cape Cod, is a welcoming place to me. I find myself spending lots of time there when the time itself is available. The cool breeze, the soft sound of the waves, and the smell of the air, each bring a peaceful feeling to me. As I walk the sand, I find that the sea spray on my face is cool and refreshing. As it hits the sand and the jetties is appears in a white foamy form. Out beyond the beach the color is a deep rich blue-green. It is inviting, with a deep dark history. The sand squishes between my toes and leaves them feeling clean and relaxed. With every step that I take, I find myself looking at different things. There are many different seashells, from small white and pink lady slippers to steamers and scallops. We find rocks each in its own shade of color: purples, white, greens, browns, and each with its own variations. Seaweed coming in many colors and shapes is caught up in many different objects. There are many other such oddities that have come to rest on the sands. I walk out on a jetty and find space to sit and watch the water break on the beach. Each time that the water breaks on the beach, it makes a slightly different sound. Each sounds somewhat like a whoosh, or a crash but at the same time, individual in its own way. I can look down and see the many lives of the water, from the schooling minnows, to the crabs crawling on the bottom. I can see the reflection of my face as well as the reflections of others that have stopped at the same spot as me. They have a look of awe and wonder, while some have a look of hate and distrust. Some look upon the water as evil, and take with them something that the water wanted them too. The ocean has a great power, and likes to make sure that our population understands that even though we enjoy power, it is truly the most powerful. Water is what we need to survive, and yet it takes so many lives in so many ways. It is almost hard to find comfort in something that can be taken in a way of death and decay. The water brings such comfort to some and such fear to others. To me it is like a welcome home when it comes to dealing with every day life stresses. ← Bring on the New Year!